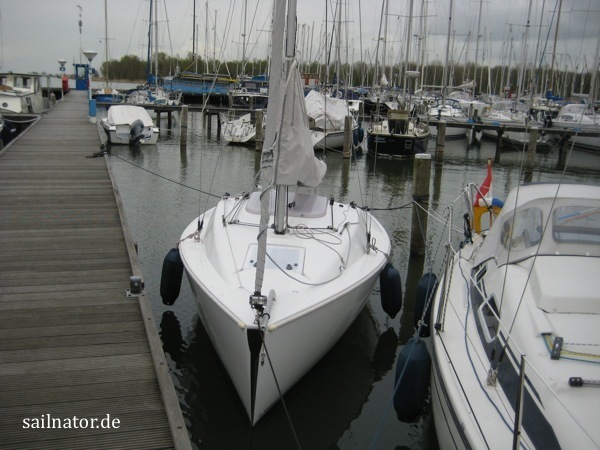 The Varianta 18 is a small keelboat, produced by Dehler in Germany. She just captured my interest when she came onto the market. 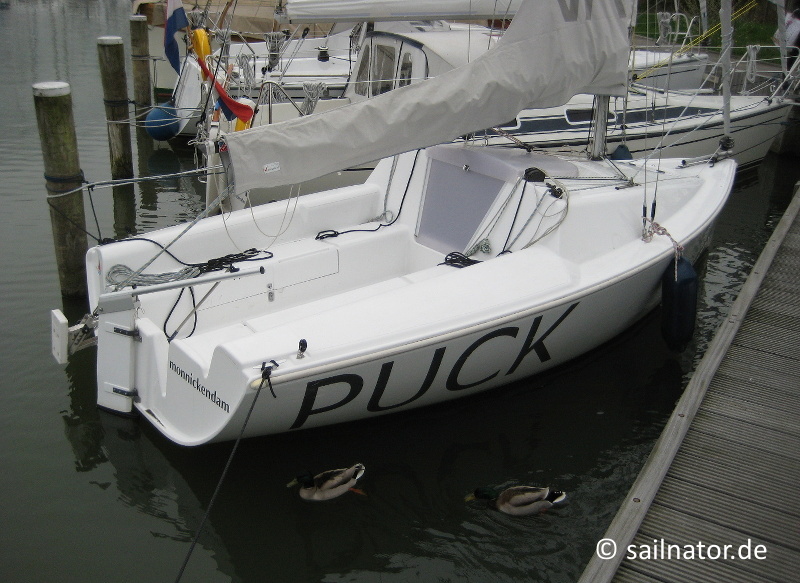 I liked the principle of a simple and affordable beginner’s boat. And on the relevant water sports fairs she also presented herself well in my opinion. There were several providers that rented the boat for a few days or a week. I decided to go to Monnickendam at the Markermeer. That is the southern tip of the Ijsselmeer in the Netherlands. It took just about three hours by train from Cologne to Amsterdam and another 20 minutes by bus to Monnickendam. I wanted to charter the Varianta 18 as a daysailer fitting the season. Because of that I rented a small flat directly at the historic harbour. From there I had a nice view of the masts of the old Dutch flatboats. The village is quite cute but in the evening it seemed deserted. Maybe because it was only preseason or it is just not a touristic destination. I have no idea. 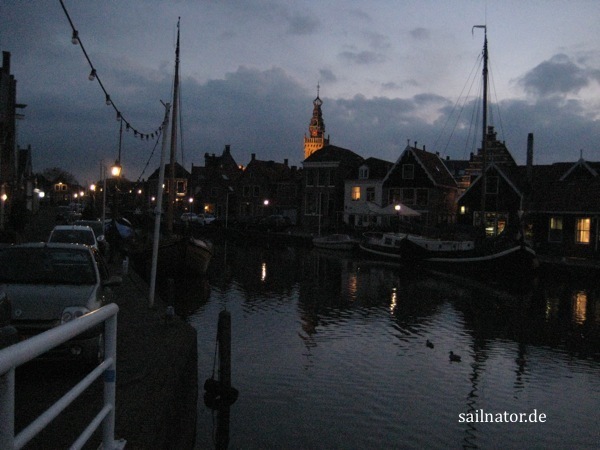 We reach Monnickendam on a Tuesday afternoon in April. We go to our nice holiday apartment and have a walk to the deserted marina in the early evening. We take a look at our “Puck” and try to do something in town without any success. We go back to our home chilled to the bones and I congratulate myself on the decision not to sleep on the boat. After yesterday’s experiences we prepare ourselves for a cold day. We wear warm ski underwear, trousers, pullover, softshell jacket and foul weather gear. An onion could not have more skins. We also wear a hat and really thick helmsman gloves. Even on our way to the marina we start to sweat. The sun is shining. And because I forgot my credit card I gasp for air on the way back to our apartment. At the charter office everybody is very nice to us. After doing the paperwork we get a basket with coffee, cookies, life jackets, compass and local charts. In the harbour everybody is busy. The yachts had just recently been put into the water after winter. Next weekend there is the season opening regatta for the regulars. The technician Jan has to interrupt his work to hand over the boat to us. That is quickly done, because there is not much on the Varianta 18 that does not explain itself to an experienced sailor. But unfortunately Jan forgets to tell us to better put the cover of the companionway under deck – but more on that later. After having thoroughly inspected the boat and taken a look at the charts we want to give it a try. The electric outboard motor pulls us backwards out of the box and we nearly turn on the spot in the narrow lane. We unfurl the jib and let it pull us out of the harbour. I want to shoot up head to wind in the waterway afterwards and hoist the sails without needing the engine. But one of the mast slides gets stuck and the manoeuvre ends with more stress and effort than I had intended. But we quickly forget that with a fresh wind blowing across the water. After the long winter we are happy to finally sail again. It is wonderful! Because we could not estimate the wind force in the harbour we already put in a reef there. We realise that it was a good decision. First the waterway is well protected but just after the next cape our “Puck” heels properly and rushes ahead even with a reef. It is quite inconvenient to pick up the chart out of the basket every time we need it. But we cannot leave it on deck because of the wind. A section of the chart covered with foil fixed in the cockpit would have been helpful. As the depth beside the waterway finally increases we try one or the other manoeuvre. But then it happens! Because we expected water coming over we left the cover on the companionway. Just in the place it actually belongs. But in our first tack the thing falls into the water – it is way too light. It is only made out of soft plastic, just like the boxes used in the refrigerator to keep groceries fresh. We have not yet coordinated our actions and all knowledge about the man over board manoeuvre proves to be plain theory. First it is covered by water and we lose sight of it. Then we see an edge looking out of the water, but it sinks before we can reach it. Brilliant. That is half the deposit gone. So much money for that piece of junk plastic. Never mind. We decide that we will not let this episode spoil this wonderful day and sail out on the Markermeer. In the meantime the wind continues to increase. White stripes of foam form in the direction of the wind on the water. I wish we had a second reef but it does not exist. Fortunately we sail close to the shore where the wind is coming from and so there is no swell yet. Sailing really shows that it can be a sport. The boat puts away the wind very well. But when it heels a lot, for example in a squall, it tends to broach. But if we sail forward-looking and head up early enough the boat really delivers fun. Anyway in my opinion a longer rudder would not have hurt. But we sail the version with smaller draught and so the rudder is shorter as well. Slowly we get into the matter together and coordination and communication gets better. We would have liked to use the gennaker too but therefore it is too much wind. Time flies and in the afternoon we go back into the waterway going in the direction of Marken and Monnickendam. Now on our way back we have to beat against the wind. In a wider section of the waterway we can just let a passenger ship coming from behind pass in the last moment. It turns to Marken. That gives us the idea to go there for a coffee before we have to return to our home port. So we start the electric motor and secure the sails. I do not take it seriously when the engine stops for a short while. I think it is because I confused forward and reverse gear. We approach the harbour. Shortly before we reach the entrance the passenger boat starts to move. In this moment of course our engine stops again. All rattling and shaking does not help. It does not start to hum that familiar electric noise anymore. Meanwhile the passenger ship is directly in front of us in the harbour entrance and we drift to the middle of the narrow waterway. Oho. What now? We quickly unfurl the jib and get to the edge of the waterway. We take the risk of grounding and let the passenger ship pass. The slides of the mainsail stuck again but after a few minutes our boat is under control. 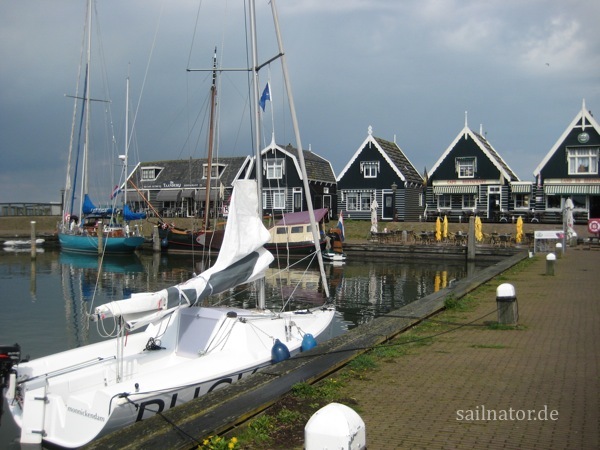 We dismiss the idea to have a brake in Marken. Now we only think about how we get back into our harbour without the help of an engine. When we started we got out to the open water with a nice wind from behind. But now we have to painstakingly beat, which consumes time. We slowly struggle from buoy to buoy. I have a look at the chart and expect that we can secure the mainsail at buoy number 10. From there it should be possible to let us be pulled to our berth by the jib. But I am not sure about the last short distance. But anyway what can we do? It happens as I thought it would be but we miss the entrance to our narrow dock. But suddenly the electric motor works again on the last meters and so we manage to berth perfectly. We clear the deck and I take the battery off the motor. The contacts corroded during the winter and are now green and are bent; probably because the battery is mounted and dismounted every day. The loose contact could be easily solved with some grease and a tong in my opinion. We tell our problems in the office and immediately the boss arrives to look what is wrong. The mainsail is hoisted without getting stuck and the motor starts and goes on running. The demonstration effect! But now we have to admit to losing the cover. We are lucky because the lost thing had a crack from the last season and a new cover already lies in the storage room. We do not have to pay for it! Unfortunately thunderstorms are forecasted for today. So we do not want to sail too far. Eventually the wind calms down in textbook fashion and turns. It starts to thunder. So we quickly sail back to the harbour. Again the engine does not start. This time we take a paddle for the last distance. That works surprisingly well. For the next day we are promised a petrol-powered outboard motor. But berthing is not allowed anywhere. I turn a lap till I recognise a sign. Pleasure crafts can stay for free for three hours. After a pancake and a coffee we leave the dock again. At 05:00 p.m. our boat has to be delivered at the office. And because the wind is still calm we reckon that we need more time for the way back. But we enjoy our trip even with low speed. Shortly before we reach the port the wind increases again. Finally we can really sail. The last hour we drive up and down between buoy 10 and 12. Now we should hoist the gennaker but the open water is too far away to be back in time. The boat even shows here what it is able to and we have a lot of fun. Reluctantly we give our “Puck” back later.